Contaminated water in the Lower Canal. Photo courtesy of BRHD. The lower canal in North Logan and Hyde Park has once again been cleared for irrigating. The canal was closed Saturday night, after oil from a chip and seal project was found in the water. 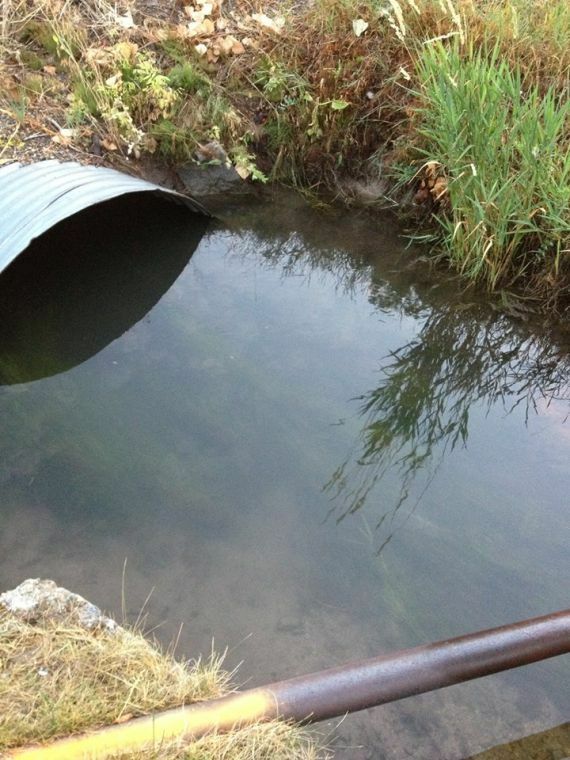 Lloyd Berentzen, Executive Director for the Bear River Health Department and Mayor of North Logan City, said water tests now show the canal is free from any contaminants. He said he is optimistic there won’t be any detrimental effect to the canal or those who use the water. Berentzen said rain Saturday afternoon washed the oil into the canal near 450 East 1800 North. The contaminated water traveled a distance of approximately 5 miles. It was diverted to a field near the Logan Cache Airport. Now that the canal has been cleaned, crews will begin removing oil from the field. Berentzen said the chip and seal project combined with Saturday’s unexpected rain, made for a unique circumstance. Water in the Lower Canal following weekend clean-up efforts. Photo courtesy of BRHD.